"Train Leaves Here This Morning"
Jeffrey Lebowski made it pretty cool to hate The Eagles in 1998's Coen Brothers classic The Big Lebowski, but that didn't stop the California country rock band from selling out massive concerts up until they disbanded earlier this year (their disbandment caused only by founder Glenn Frey's sudden death, which means this time it's likely for good). 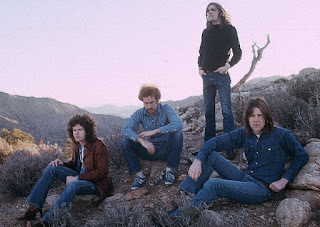 Love them or hate them, today The Eagles are considered one of, if not the, biggest U.S. bands of the 1970s (maybe ever). By many, however, they are dismissed as inauthentic sellouts to stadium rock. After a successful stint backing up Linda Ronstadt, Glenn Frey and Don Henley decided to venture out and start their own country rock band, The Eagles. They were immediately successful, building on what The Byrds, Buffallo Springfield, The Flying Burrito Brothers, The Nitty Gritty Dirt Band, Crosby, Stills & Nash, and others had started before: smooth country-based ballads with pleasant harmonies. The genre didn't have the grit and sweat (or authenticity) of outlaw country of Johnny Cash or Waylon Jennings, nor the goofy polish of Nashville establishment acts like George Jones. These weren't cowboy campfire songs and the musicians weren't from The South, rather, the music was light and breezy like waves gently crashing on the desert. That style would go on to influence the sound of light 1970s AM rock (a sound expertly mocked in Documentary Now's Light & Breezy: The Story of the Blue Jean Committee, which took direct aim at The Eagles' inauthenticity). The knock against The Eagles is that they were too polished. Even for California country music. A few years after their 1972 debut, they added rock guitarist Joe Walsh in a move to further themselves from an acoustic country sound. People forget that in 1974, although they were successful, The Eagles were often still opening for bigger acts like The Allman Brothers (to be fair, bills were typically stacked with several big acts in those days). They were big, but they weren't the biggest yet. Adding Joe Walsh, who rose to success with The James Gang and handful of successful solo albums, was a pretty big get. It propelled The Eagles to the top with 1976's massive hit Hotel California, one of the biggest rock albums ever. Joe Walsh replaced Eagles' founding guitarist Bernie Leadon who had grown tired of the grind of studios and touring, and some say, was against Frey and Henley's move away from light country rock. Of all of The Eagles hit songs, my favorite Eagles song was always Bernie Leadon's "Train Leaves Here This Morning" from their debut album. For a long time I thought it was an obscure, forgotten nugget buried on an album with big hits, but when I went to arrange my version, I discovered the song has quite a bit of life among country bands. It's something of a standard. The song originally appeared on a Dillard & Clark album, one of Leadon's previous bands he played in. He brought the song with him to The Eagles and since then it's become something of a signature tune for him, eventually playing it when he rejoined The Eagles for some of their recent tours. I got a little ambitious with the tune. I wanted to slow it down, and give it some space to breath. That left it really empty in places, my voice alone couldn't carry it, so I added some totally improvised harmonies which I discovered is a huge part of the song. Since I've moved recently, the new room I've been recording in is pretty open and echoey at the moment, so the bass is a little muddy (probably a good time to record some Phil Spectre material) but it seems to have covered some of my harmony deficiencies. Shortly after the Allman Brothers reunited in 1990 they were invited to MTV's all acoustic Unplugged program. An acoustic show might seem unremarkable today, but after a decade dominated by electronic synthesizers and hair bands' guitar amplifier's gain turned to 11, the idea of an all-acoustic show was refreshing, if not revolutionary. The show felt impromptu (in the case of the Joe Walsh and Dr. John pairing, it actually was) but the Allman Brothers took it as seriously as their reunion. This was a chance to show a nationally televised audience that they weren't a dinosaur band. It was also an opportunity to show casual fans that they weren't just a guitar band that jammed for hours. They performed lovely versions of acoustic-based classics Gregg Allman's "Midnight Rider" and "Melissa", and introduced their latest album's title track, Dickey Betts' "Seven Turns". But they also dusted off some old blues songs, Robert Johnson's "Come On Into My Kitchen" and the traditional "Going Down That Road Feeling Bad". The performance was so successful that they added an acoustic set to the middle of their live shows for the next few years. 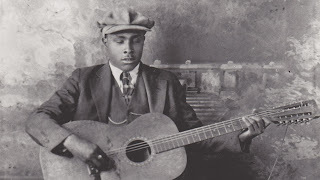 One of the songs Dickey Betts brought to the band for their expanded touring acoustic set was an old Blind Willie McTell song, "Blues 'Round Midnight". The story goes that he had remembered it wrong, to the point it was almost a completely different tune. Enter "Midnight Blues" which appeared on the Allman Brothers' next live album, An Evening With. I recorded most of this song last Summer. I wanted to put a sax solo on it, but my sax chops have a ways to go to catch up to my 13 year-old self. The cigar box guitar fits in enough, I didn't want to over stuff the song.